One of my favorite parts of spring is when the gnarly, old apple tree in our backyard explodes with fragrant, pinkish-white flowers. As soon as you take a step out the backdoor, you can smell the incredibly sweet scent of the apple blossoms. 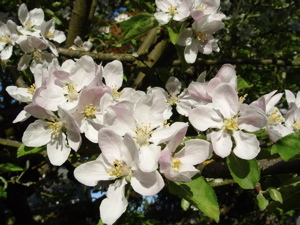 Given the large number of blossoms on our apple tree, we get surprisingly few apples in late summer and fall. One big factor in this is that we have a lonely tree. It’s the only one in our yard and none of the neighbors bordering our backyard have an apple tree. Apple trees are considered self-incompatible, or in other words, they cannot pollinate their own flowers or any flowers of trees of the same variety. If an apple tree can get cross-pollinated from a tree of another apple type, it will greatly improve the quality and yield of the apple harvest. Our apple tree is large and its small apple production is still way too much for Carol and I to take advantage of, so we’re not too concerned about improving the apple production. If we were, though, we’d have to be sure to pick out another apple tree that blooms at the same time as ours, since the flowers only bloom for a short time. 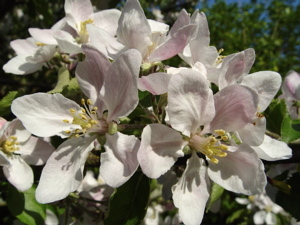 A crabapple tree could also provide suitable pollination if both trees bloom at the same time.